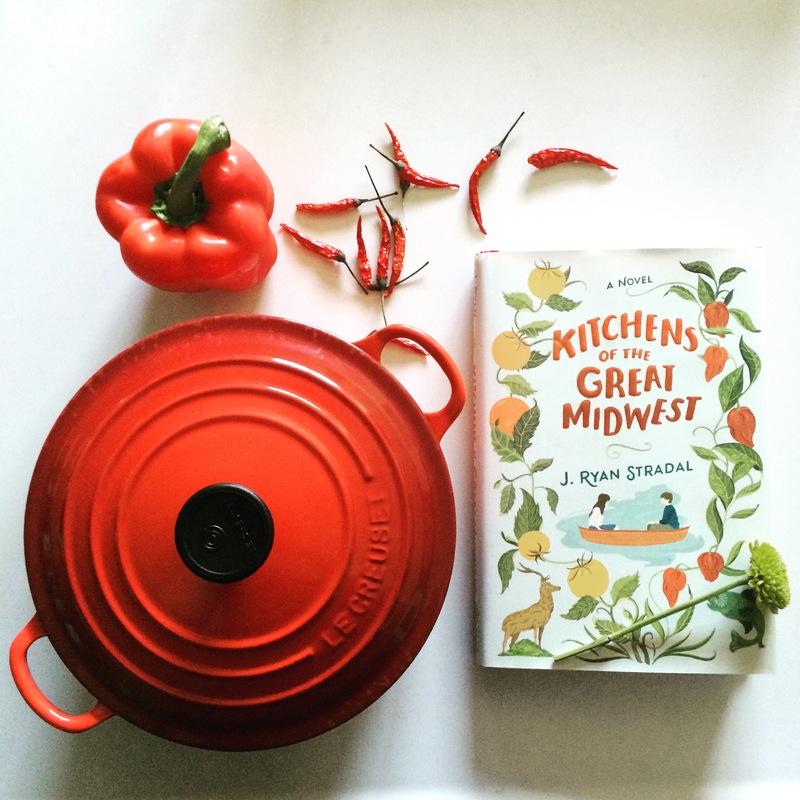 When I picked up J. Ryan Stradal’s debut novel, Kitchens of the Great Midwest*, I was expecting a straightforward coming-of-age novel about a girl who becomes a chef, with a few mouthwatering recipes and the strong potential for heartwarming-ness. A palate cleanser between heavier reads, if you will. This book is much, much better than the one I imagined. Near the end of the novel, one character tells us that “stressed vines often lead to wonderful wines” (259). That could be the metaphor for the life of Eva Thorvald, the novel’s main character, who we catch in glimpses from birth until her late twenties. She has a “once-in-a-generation palate” and becomes a star chef (which is perhaps not surprising since her parents are a cook and a sommelier) but not before she endures and embraces many challenges. Her story unfolds through chapters told from different characters’ perspectives (only one from her own), almost like linked short stories. These characters include her hilariously foul-mouthed cousin Braque, a high-school boyfriend, and a disgruntled Sunday-supper participant, among others. The novel is often very funny, but it handles with grace and careful consideration difficult topics like death, job loss, divorce, bullying, and unplanned pregnancy. The result is a harmonious melding of sweet and bitter, with a beautifully constructed ending. If you like local food (or, conversely, critiques of the pretentiousness of foodie culture), novels with recipes, the Midwest (and please, let’s have more novels about the Midwest! ), books about the underdog, books about people who aren’t rich, books that will make your mouth water, or all of the above, you’re going to want to sample this book, and then devour the whole thing. Sincere but not sappy, generous but not naive, Kitchens of the Great Midwest will have you calling to memory the best meals you’ve ever had, and calling the people you love best to say hello. If you had to define an era of your life with a recipe, which would come to mind first? If you’ve read Kitchens of the Great Midwest, which other novels did it remind you of? I have two very different candidates: Making Nice by Matt Sumell (review here) and Like Water for Chocolate by Laura Esquivel. OK, this is totally beside the point, I know, but I have that exact same Le Creuset pot, and I must say that it makes a nice picture with the book. I haven’t read this book, but if you liked it, you might also like Mastering the Art of Soviet Cooking by Anya Von Bremzen. An era of my life? Perhaps my whole life could be defined by that magic number, 1-800-STOUFFERS. (OK it’s not a real number, but you get the idea,) Nonetheless, and overlooking the fact that it’s the dreaded coming-of-age novel ( which is usually worse when it’s about boys), this sounds as if it were a book that I might really enjoy. Thanks for the delightful review and terrific picture. It *is* a nice pot, and the peppers scattered about are also a nice touch. I love red! OH! Dear Blogger! I have a few sugs for you on related short story collections… Junot Diaz’s This is How you Lose Her, Olive Kitteridge (by Elizabeth Strout), Winesburg Ohio (I wasn’t impressed but could have been me) and The Imperfectionists by Tom Rachman. Thanks, I might finally be interested in this. I was resistant at first and I really don’t know why.